Witnessing people organising their table of food to perfection before taking a photo from birds-eye view isn’t a rare sight in restaurants nowadays. Food is officially the star of social media, with #food being on over 200,000 tags and counting on popular photo-sharing app Instagram. 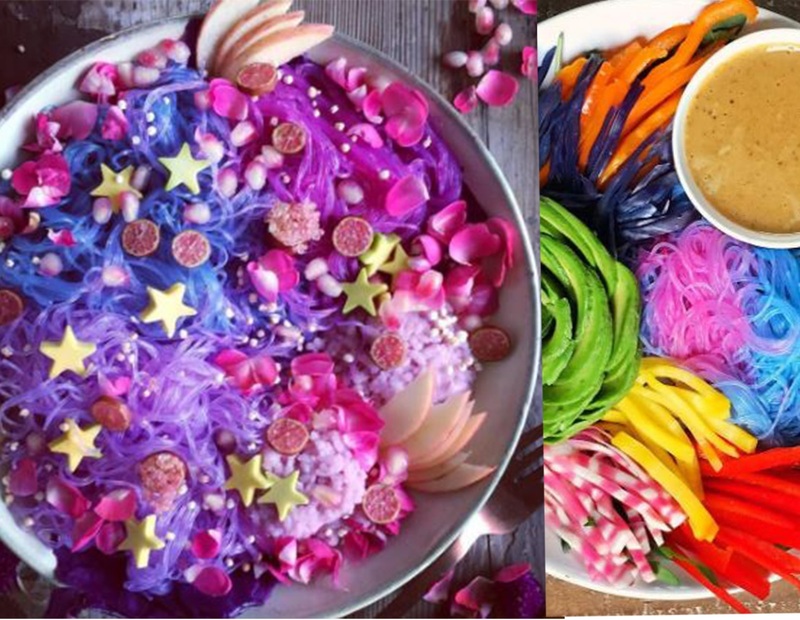 Forget about rainbow macaroons and Oreo cheesecakes, the most recent food trend is something nothing less than magical; Unicorn Noodles. Creation of Instagram foodie @theindigokitchen from the Netherlands, the noodles are taking social media by storm, and he describes the noodles as ‘quick and simple’ to make, with 3 ingredients. Soak purple cabbage in water – the amount of water and time spent soaking will affect the concentration and intensity of colour you’re left with. The purple cabbage essentially ‘dyes’ the water, so pop in your white or clear noodles to turn them blue, and add lemon or lime juice where desired to add hues of pink and purple. If you want to undo the purple or pinkness, adding an alkaline like baking soda will give you green-blue hues. Food chemistry is pretty cool, eh? They’re vegan and nutritious and can be added to a load of meals. Make a unicorn stir-fry, add to a curry, a salad – the options for magical, colourful food are endless according to AJ, the genius vegan chef behind The Indigo Kitchen. Being so easy to make, and insanely aesthetically-pleasing, I can confirm I want to try these magical, colourful noodles immediately. I’m off to follow AJ on Instagram and stalk the #unicornnoodles tag.